Spring is a time when all of our planting and watering finally pays off, yielding beautiful blooming flowers. This simple philosophy is the same one we apply to PNC’s long-standing corporate philanthropy focus of early childhood education. This year, in the early days of spring, we celebrate the 15th anniversary of PNC Grow Up Great, a bilingual initiative to help children from birth through age 5 prepare for success in school and in life. A lot has changed in 15 years but one thing has remained the same – our focus and commitment to improving access to quality early childhood education. In 2004, when our employees chose this philanthropic focus, investing in early childhood education generally did not have the widespread support it does today. Fifteen years ago, in our headquarters state of Pennsylvania, the government didn’t even have a line item in their budget for early childhood education, and fewer than 2,400 3- and 4-year-olds were enrolled in state funded preschool programs. In 2017, more than 28,000 3- and 4-year-olds were enrolled in Pennsylvania state-funded preschool programs, according to research done by the National Institute for Early Education Research (NIEER). 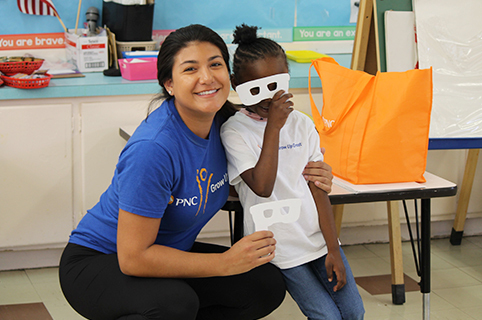 To date, more than 5 million children across the country have been supported through PNC’s grants and educational programming. PNC has moved the needle over the past 15 years because of our comprehensive approach to early childhood education. Grow Up Great goes beyond the classroom, supporting learning and social-emotional development at home and across communities, by providing free resources and tools to parents, guardians, teachers and caregivers. We’ve made a difference because there’s power in numbers – and not just financially speaking. Our employees spent more than 100,000 hours volunteering for Grow Up Great in 2018, up 13 percent from 2017. That trend is significant and powerful. We also have the full unwavering support of our executives, including CEO Bill Demchak. This broad and deep network of support within our organization is the reason we’ve impacted so many young lives. Fifteen years later, that’s still what makes us stand out. PNC has made a difference by leveraging its influence with the business community, policymakers and other key stakeholders to garner support for quality early childhood education. Over the years, we’ve teamed up with exceptional partners that share our goals such as the Sesame Workshop, Fred Rogers Productions and the National Head Start Association (NHSA). Our advisory council is comprised of some of the nation’s most highly respected early childhood experts. Working with The Pew Charitable Trusts and Committee for Economic Development (CED), PNC launched the first-ever summit of the nation’s top economists to explore the economic impact of investment in early education. Today in 2019, there is more awareness that the future of our world is in the hands of today’s young children. It’s understood that between birth and 5 years of age, the brain develops rapidly to build the foundation of cognitive and character skills necessary for success in school, health and life. Inversely, inequality in early childhood education produces inequality in ability, achievement, health and adult success. It’s more widely accepted now that the same dollar will go much farther if invested early than it will later on. More and more research is showing that quality early childhood education reduces dropout rates, poverty and crime, while improving the skills of the workforce of tomorrow. Through the years, we’ve been a leader in this space – a corporate voice where there have been few. We’ve helped to improve access to early childhood education because we believe that corporations like us are responsible for working together to help solve our communities’ most critical problems. For 15 years, we’ve been driven by our core belief that all children deserve to begin their lives on equal footing and receive high-quality early learning experiences that have a lifelong positive impact. We’ve come a long way over the years, but we know our work won’t be done until that vision becomes reality. Until then we will keep planting the seeds to help children bloom and thrive in all of the communities we serve. Sally McCrady is chair and president of The PNC Foundation.